DIE Lunæ, 21 die Januarii. Message from H. C. with Bills; and to return Scawen's. D. of Bucks' Claim to the Title of Lord Roos. Message from H. C. for a Day to hear L. Mordant's Cause; and to remind the Lords of the Bill for Judicature about Houses burnt in London. Lives on Estates, for Discovery of Bill. 1. To return a Bill sent to the Commons, for restoring in Blood Francis Scawen Gentleman, to which the Commons agree. 1. "An Act for Confirmation of a Settlement of the Estate of Sir Seymour Shirley Baronet." 2. "An Act for settling the Molety of the Manor of Iron Acton on Sir John Poyntz." "1. That the said Petition is not against the Earl, but against his Son, who is not made a Party, nor summoned to appear." "2. That the Duke of Bucks doth not in his Petition set out by any Matter how he derives his Title of Lord Rosse, soas no certain Answer can be made thereunto." The Question being put, "Whether to proceed further upon this Petition of the Duke of Bucks?" Upon this, the Counsel were called in, and told by the Speaker, "That this House will proceed upon this Business To-morrow Morning, at Ten of the Clock." To desire their Lordships would please to appoint a Day for hearing the Cause concerning the Lord Viscount Mordant, upon the Impeachment brought up from the House of Commons against him. 2. To put their Lordships in Mind of a Bill depending in this House, for erecting a Court of Judicature to determine the Differences that may arise concerning Houses lately burned in London. ORDERED, That Saturday Morning next is appointed to hear the Cause upon the Impeachment of the House of Commons against the Lord Viscount Mordant. That this House hath appointed Saturday Morning next, for the hearing the Cause upon the Impeachment of the House of Commons against the Lord Viscount Mordant. Touching the other Particular of this Message, this House will send an Answer by Messengers of their own. 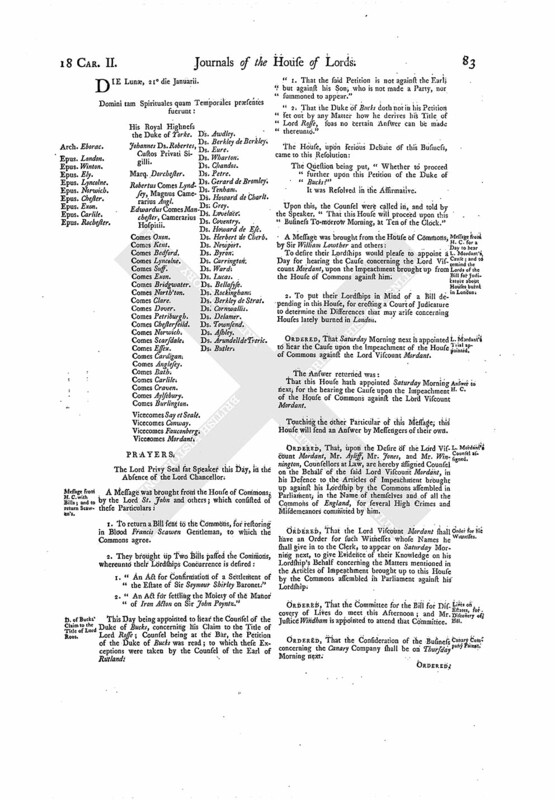 ORDERED, That, upon the Desire of the Lord Viscount Mordant, Mr. Ayliff, Mr. Jones, and Mr. Winnington, Counsellors at Law, are hereby assigned Counsel on the Behalf of the said Lord Viscount Mordant, in his Defence to the Articles of Impeachment brought up against his Lordship by the Commons assembled in Parliament, in the Name of themselves and of all the Commons of England, for several High Crimes and Misdemeanors committed by him. 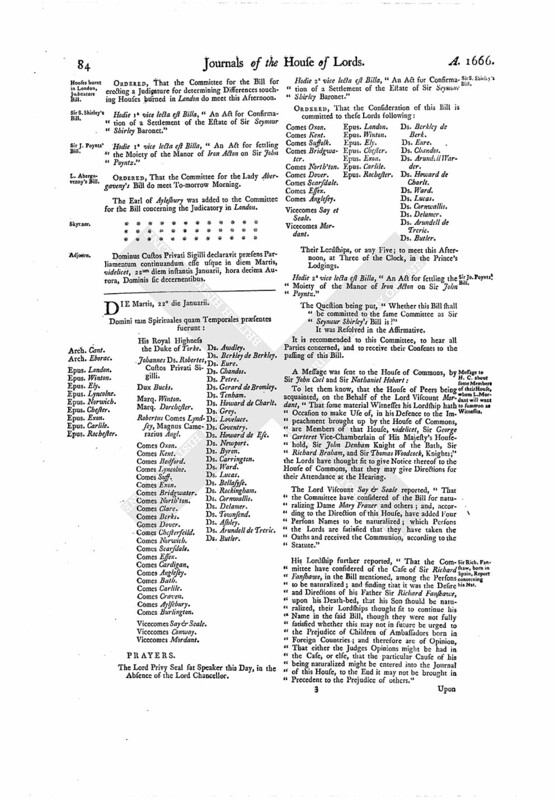 ORDERED, That the Lord Viscount Mordant shall have an Order for such Witnesses whose Names he shall give in to the Clerk, to appear on Saturday Morning next, to give Evidence of their Knowledge on his Lordship's Behalf concerning the Matters mentioned in the Articles of Impeachment brought up to this House by the Commons assembled in Parliament against his Lordship. ORDERED, That the Committee for the Bill for Discovery of Lives do meet this Afternoon; and Mr. Justice Windham is appointed to attend that Committee. ORDERED, That the Consideration of the Business concerning the Canary Company shall be on Thursday Morning next. ORDERED, That the Committee for the Bill for erecting a Judicature for determining Differences touching Houses burned in London do meet this Afternoon. Hodie 1a vice lecta est Billa, "An Act for Confirmation of a Settlement of the Estate of Sir Seymour Shirley Baronet." Hodie 1a vice lecta est Billa, "An Act for settling the Moiety of the Manor of Iron Acton on Sir John Poyntz." ORDERED, That the Committee for the Lady Abergaveny's Bill do meet To-morrow Morning. The Earl of Aylesbury was added to the Committee for the Bill concerning the Judicatory in London. Dominus Custos Privati Sigilli declaravit præsens Parliamentum continuandum esse usque in diem Martis, videlicet, 22um diem instantis Januarii, hora decima Aurora, Dominis sic decernentibus.